RICK ALLEN, Co-Founder, EP, Director – broadcast video producer and videographer has been diving the oceans of the world and shooting video since 1983. As a video producer, director and videographer his work has appeared on ABC, A&E, BBC, CBS, 60 Minutes, Discovery, The Learning Channel, 48 Hours, ESPN, Lifetime, National Geographic, Turner and more. He has traveled from Cuba to Kazakhstan with the US Military, weathered live broadcasts during hurricanes and gone nose to nose with 14 foot Great White sharks during underwater expeditions. After 12 years in broadcast television Allen opened his own video production company in 1997 focused on documentary production and providing freelance videography and underwater video services to broadcast clients. Allen is an avid wreck diver and shark lover who can be found most weekends diving the Graveyard of the Atlantic. CINDY BURNHAM, Co-Founder, Still Photographer – Cindy’s thirty plus years of photojournalism experience reflects the extremes of humanity and nature. From the intensity of the warfare reflected on an American soldier’s face, to the surrealness of an underwater morgue of an Atlantic shipwreck, her images have appeared on the covers and pages of Newsweek, New York Times, and the Time Life book, Sky Soldiers. Additional publications include, Army Times, USA Today, The Philadelphia Inquirer, and numerous other monthly, weekly, and daily periodicals. She is the co-founder of Nautilus Productions, a freelance photography and video company. She retired as the senior photographer at the Fayetteville Observer in 2016. Her work has repeatedly been recognized by both North Carolina and South Carolina press photography associations. KIMBERLY FAULK, MA, Marine Archaeologist, Historian, Field Producer – Faulk graduated with a BA in History and a minor in theatre from Roanoke College in Salem, Virginia. She holds a Master of Arts from East Carolina University, Greenville, North Carolina from the Program in Maritime Studies. Her research for the last several years has focused on the S.S. Commodore, an ocean going steam tug that was illegally running guns to Cuba and sank in 1897 near Ponce Inlet, Florida. Faulk has worked in the archaeological community since 1998. She spent two years with North Carolina’s Blackbeard Shipwreck Project, three years with the Ponce Inlet Lighthouse Association as Principal Investigator for the Commodore Project, and two years with the St. Augustine Lighthouse & Museum and the Lighthouse Archaeological Maritime Program as Field Director. Her underwater work has taken her all along the East Coast, Gulf of Mexico and Great Lakes on projects ranging from Colonial American to World War II sites. Formerly Faulk worked as the Sr. Marine Archaeologist/Business Development Manager at Geoscience Earth and Marine Services Inc. (GEMS) in Houston, Texas. She was responsible for interpretation of high resolution geophysical data (AUV and conventional), ROV target investigations, and archaeological assessments. Currently she is the COO of the PAST Foundation whose goal is furthering their vision of bringing community, industry, and educators together to find new solutions to best prepare the students of today and tomorrow. Faulk is also an avid tech diver and equally at home in either zero visibility or blue water. LAWRENCE TAYLOR, MSc, Producer, Writer, HD Videographer, Biologist – Taylor’s photographic career began at the knee of his freelance cinematographer father in Toronto where he also worked as a commercial stills photographer. After completing a BSc degree and diving certification at the University of Guelph, he taught science and math at Pickering College, Newmarket, before moving to Halifax to complete his MSc degree at Dalhousie University. After graduate school, Lawrence developed his underwater videography skills during a three year scientific scallop project in Lunenburg. Since then, and 1,000 hours diving and snorkeling later, Lawrence has surfed the technological digital wave in underwater filming, non-linear editing, word processing and Internet communications to film, write magazine articles, host TV shows, produce Industrial Environmental videos and marine related radio pieces. Since 1997, Lawrence has filed “Under the Sea”, a monthly radio column on “Information Morning”, CBC, Halifax and continues to give lectures and public video presentations: Dalhousie University, U. of Maine, Ontario Science Centre and Boston Sea Rovers. Lawrence still remains tightly associated in the field of science and continues his research on Atlantic Salmon towards a PhD. Taylor specializes in Natural History productions above and below the water, in dry suits or manned submersibles from the Arctic to Haiti for clients like CBC LAND & SEA/COUNTRY CANADA, Survival Anglia, and Discovery. Taylor also shoots for dramatic and documentary productions like Paramount’s SIGHTINGS, Salter Street’s LEXX: THE DARK ZONE and Eco Nova’s THE SEA HUNTERS. NOMEE LANDIS, Writer, Producer – Landis has enjoyed a writing career in newspapers for more than 10 years. After earning a journalism degree from the University of North Carolina, she worked as a reporter, an editor and a columnist at two newspapers in southeastern North Carolina. In February 2008, she plunged into the freelance writing and editing business. She recently launched Nomee Ink, a writing, marketing and publishing firm in Fayetteville, N.C., where she lives with her husband, three children and assorted cats and dogs. Most recently she completed the book “Answering the Call,” the story of the Texas Army National Guard’s 36th Combat Aviation Brigade and its experiences in Operation Iraqi Freedom in 2006 and 2007. She is working to bring her creative ideas to the marketplace and in her spare time enjoys pondering how she can bring a little more country to her home in town. ROBYN MOORING, Writer, Producer – Mooring’s 19 years of working in broadcast media and video production have taught her that there’s no such thing as a boring story. Through her experiences in covering a wide spectrum of issues involving crime, natural disasters, business, state and local government, politics, the arts, education, sports, parenting, and healthcare, she has learned that whenever people are involved, a good story is waiting to be told. Mooring is also a video editor and award-winning print writer and has worked as a speechwriter, an adjunct Journalism professor, and a writer and associate editor for a parenting magazine. She is a graduate of UNC-Chapel Hill with degrees in Journalism and Political Science. RIC HASE, Audio & Lighting – Since 1978, Ric has been involved in the acquisition side of video and film production. After graduating from Syracuse’s School of Newhouse Communications, Ric landed a job with WTAE-TV in Pittsburgh as an Associate Director /Promotions Writer. In 1987 Ric left the sequestered protection of studio production to explore the world of freelance, and in the following 6 years acted as grip for numerous feature films being shot in the Pittsburgh vicinity. He also freelanced as a sound tech for various production houses in Pittsburgh before moving North to the chillier climes of Upstate New York and Cornell University. For five years, Ric was on staff with Cornell University’s Media Dept. as a videographer. Eventually, the harsh winters got to him, and he decided to move down to warmth of the people and climate of North Carolina. There he took his first position as a broadcast re-seller, helping solve his client’s various video, sound and lighting needs. However he missed the joys of freelance and in late 2001 took a sales position with Technical Video Systems, eventually followed by full time work as freelance soundman. Ric takes his mantra that he is “There to make his videographer and producer look good” to heart and is a valuable asset to the Nautilus crew. SIR EDWARD THATCHER (THATCHER), Mascot – I joined the Nautilus Productions staff in June of ‘17. 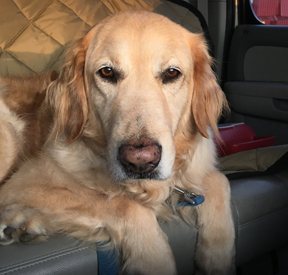 The wonderful folks at Neuse River Golden Retriever Rescue – Raleigh (NRGRR) nursed me back to health after I was turned in at a shelter with a chain infecting my neck. My fosters Christine & Erin took great care of me and got me ready for my new adventure. My new family has decided to name me Sir Edward Thatcher. Apparently it has to do with a famous pirate and some lady named Karma. I don’t exactly understand but I think I like her. My activities include being an expert swimmer, riding shotgun in my dad’s truck, being a pre-wash specialist, ball fetcher, supervising edit sessions, guarding the perimeter and being a part time buccaneer & pyrate. You can follow me on Facebook. LUCKY DOG, Mascot – Lucky Dog joined the Nautilus Productions staff in February of ‘04 as the team Golden Retriever. After a brief stay at a local animal shelter he was rescued and became the official Nautilus mascot. His primary duties consist of initiating tug-of-war matches, going for rides (his favorite) and taking the staff on forced marches at the end of each day. Lucky Dog loves watching television, sleeping under the edit desk and greets all visitors like long lost friends, with much gusto and tail wagging. Lucky Dog left us in January of 2017 after 15 wonderful years on this earth. His Golden spirit is with us every day.